"Hannah had a fantastic few days. She learnt lots of new skills and enjoyed spending time with new and old friends. We are away for the second week but Hannah is considering staying with her Nanny so she can attend! Looking forward to next year already. Thank you - and all your team"
"My daughters really enjoyed the football club again. Lisa's comments were it was fun, you learnt new skills, she really liked the coaches and the World Cup! Chloe liked the World Cup, coaching sessions and just being involved. 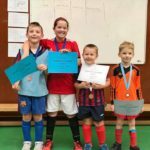 I personally think it's a really well run club which all the kids seem to love which is great because everyone is included no matter what their ability"
"Jordan loved it. The first thing he said on his way home was 'I can't wait to come again next Saturday!' "